The idea for New Blood Art, an online gallery for emerging artists, seeded itself in Sarah Ryan’s mind while she was at art school in the early 1990s. She knew there was an appetite for genuinely affordable artwork, yet she and her fellow art students were supporting themselves by taking part-time jobs in bars. “All our drawings were going in portfolios under our beds,” she says. “But I couldn’t quite work out how to resolve that disconnect without the overheads of a physical space.” On the cusp of the millennium, with a world newly online, she realised the internet had become a viable way to help young artists sell work, and New Blood Art was launched in 2004. Each year Ryan scours art school graduation shows across the UK, and invites artists to show, exclusively, with New Blood Art. Currently there are about 150 names listed on the site, and around 50 new artists join each year. Artists who accept Ryan’s invitation, or make a successful submission to her, upload images of their work to the website along with a brief profile. 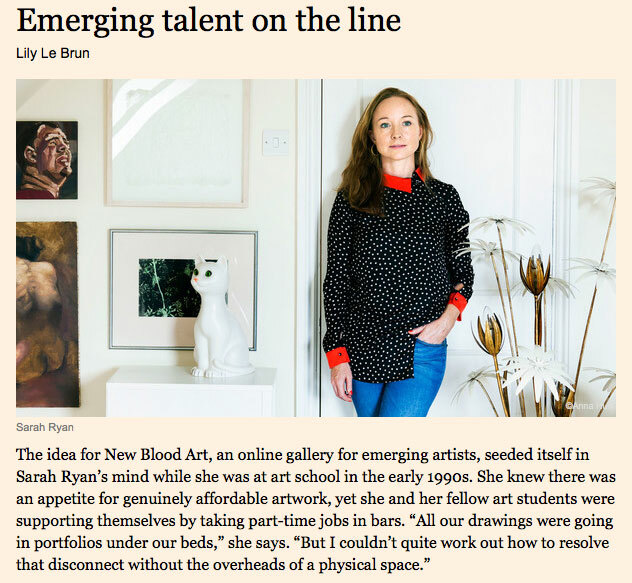 Customers buy art directly from the website, and New Blood Art takes a 40 per cent commission. Prices are set at between £175 and several thousand pounds. The average sale price is around £400. A web-only sales platform allows the prices of the artworks to be kept low, for work to be available year-round and for more artists to be shown than would be possible in a normal commercial gallery. But, Ryan says, with disarming honesty, “I wasn’t at all sure if people would buy online, because, in truth, I didn’t feel like I would have done. There’s something about seeing work in the flesh, there’s some kind of energy about it that doesn’t translate online. So I’ve been consistently surprised by the fact that people do.” The value of the online art market has risen from $1.57bn in 2013 to an estimated $2.64bn in 2014, according to the Hiscox Online Art Trade Report 2015. But although the internet is becoming an increasingly acceptable venue for showing, buying and selling art, Ryan continues to recognise the limitations of an online-only platform. In May this year she launched a Kickstarter campaign — supported by many of her artists — to fund a space that would act as a gallery, a studio and a project space for workshops and talks. It failed to reach its target, which she blames on a number of reasons including a lack of clarity in what they were offering and a failure to reach a wide enough audience. The campaign was a response to the paradox that has arisen over the decade that the site has been active. What happens when budding artists mature? Many go on to be represented by more established galleries, who can support higher prices and regular exhibitions. “Of course if an artist secures gallery representation, and we have helped them gain wider recognition and set them on a meaningful career path, then that’s great.” Ryan says. “Though it does also mean that we are putting in the legwork but losing the artists just at the time when there’s more scope for long-term revenue.” Ed Saye’s ‘Three Girls’ (oil on panel, £1,250) The New Blood Art site now features a “masters’” section to distinguish those artists who are further along in their careers. But Ryan is aware that this is not enough: her artists still show a real hunger for their works to be seen in the flesh, and the online format also limits the scope of what work can be shown. Work chosen for the site leans towards a conservative aesthetic: landscape and figurative paintings predominate; sculpture and multimedia work are more difficult to showcase accurately online and are expensive to ship and install. But a physical space runs the risk of compromising the business’s low overheads and straightforward buying experience, which attract those purchasing art for the first time — the site’s target audience. Keeping the prices down has been critical to its success. (The bulk of online art transactions, the Hiscox report found, take place below £10,000, which is exactly New Blood Art’s maximum price point.) Ryan is also adamant that prices remain at a realistic level so that the gallery does not risk harming an artist’s market when it is at its most tender. “I feel that people who are showing work by young artists have some kind of responsibility to offer guidance on that early on,” she says, adding “one of the concerning things about so many online platforms is that there doesn’t seem to be any guidance on pricing at all.” Even when she discusses the commercial side of the business, Ryan’s interest in education is in evidence. “My hope for New Blood Art,” she says, “is that we provide some kind of incubation for that period just after graduation — and sometimes before — to give artists not only some kind of revenue stream, but an idea about showing and selling.” Galleries catering to the lower end of the market are disappearing in the current climate, and many artists who struggle to find representation are trying to sell from their studio, which can be damaging to their work as well as their market. “There’s a bit of a crisis at the moment,” she believes. “There’s a real need for something in between art college and attempting to embark on a career.” Plans to introduce a mentoring scheme for artists are in the pipeline, as well as ways of nurturing a sense of camaraderie between those the gallery represents — especially now that artists are finding it more difficult to form communities as high prices force them to find studio space out of London. Eventually, the hope is that profits made from sales of work by the more established names would feed back into the company to help those just starting out. Given these didactic ambitions, a physical space that could provide a venue for workshops, activities and exhibitions alongside the online platform seems to be the natural next step for New Blood Art — provided funds are raised successfully next time. But although it remains uncertain when or if a project space will materialise for New Blood Art in the future, what is clear is that it will continue to try and provide that missing “something” for artists, whether it exists online, offline or both.